With a focus on maintaining a completely safe industrial environment this paper will give provide information on Arista specialized range of non-incendive, corrosion resistant and HMI embedded system with thin clients industrial panel PCs, touch panel PCs, UL class 1 division 2 certified specialized for work in food processing, cold storage, pharmaceuticals and other harsh industrial environment. The complexity of today’s industrial automation needs, demands a safe and secure working environment. Manufactures and end users require more extensive effort to invest and comply with security regulations to avoid any unexpected fire or explosion hazard. Specifically when it comes to hazardous area classified locations. Electrical equipments in the industrial area are prone to cause explosions under certain atmospheric conditions. There are several ways of protecting electrical equipment hazard, to avoid explosion when used in flammable materials, combustible and fibers. An Explosion is a sudden expansion involving physical or chemical decay with a rapid increase in pressure, resulting in a heavy blast and shock. In a chemical explosion molecule decomposes into combustible gases produced at a very high temperature. 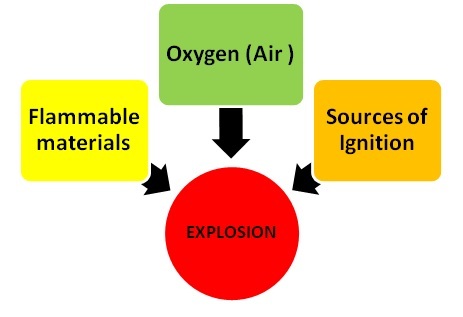 For an explosion to take place three factors which are flammable materials, air (oxygen) and ignition sources has to be present in sufficient quantities in the atmosphere. An explosion does not occur only in the presence of flammable materials, there should be sufficient quantity of such materials present for any hazard to occur. However, there are plenty of classifications and requirements that fall under hazardous zone and their level of severity. Country Specific regulating bodies set up standards for safety, explosion protection and level of severity. Design Regulations for anti-explosion electrical industrial automation equipment,Hazardous locations. Regulations are specifically meant for equipment to be used in hazardous locations defined by law. However, these might vary according to the location, country laws and other factors. Equipment not pertaining to regulations can counter delay in their shipping and face legal and liability issues. Regulations for Class/Division system are formulated by NEC, CEC, OSHA and NFPA (National Fire Protection Association).It is mandatory for every manufacturer to adhere by compliance, these are monitored by UL and other testing groups as mentioned above. After equipment pass test they are provided with a certificate stating; “explosion protection safety conditions are met and they are secured to be used for production”. International Society of Automation (ISA) and the American National Standard Institute (ANSI) have defined the non-incendive standard for electrical equipments to be used in hazardous locations. These standards provide design, construction and electrical marking requirements to be used in Class I and Class II, and Class III, Division 1 and 2 hazardous locations. 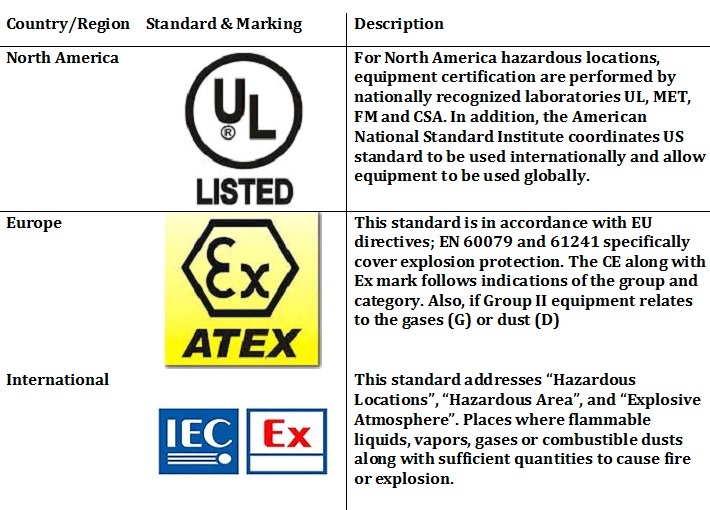 In simple terms, hazardous classified location is any area, building, commercial or industrial premises which are likely to be exposed to fire or explosion due to the presence of flammable gases, vapors, flammable liquids, combustible dusts and other similar things in the very high amount. Hazardous locations can be classified into various categories according to the nature of flammable vapors or liquids. These categories can be defined by classes and classified by NFPA Publication 70, NEC and CEC. 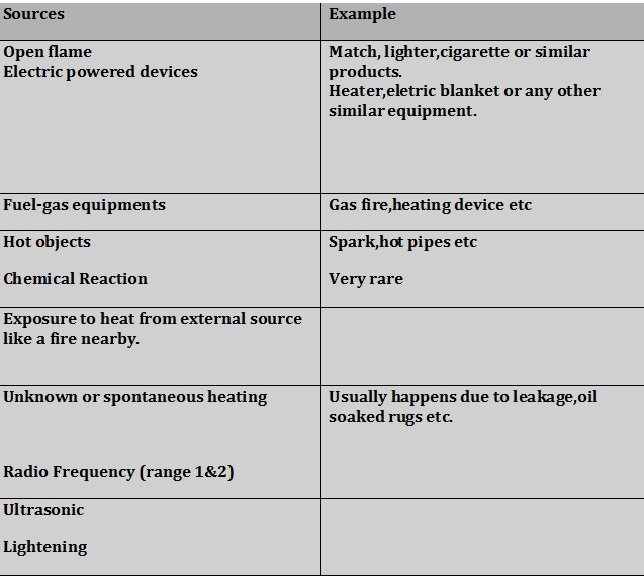 Below are the classification of locations and division, which define the type of explosive or ignitable substance present in the atmosphere. In the United States and North America, manufacturer’s in general follow standards set up by National Electric Code (NEC). Other popular classifications are NFPA publication and CEC. These benchmarks along with NEC specify type of hazardous materials based on class, division and groups. Class/Division standards are the primary methods catering the design and manufacturing of industrial equipments across North America. 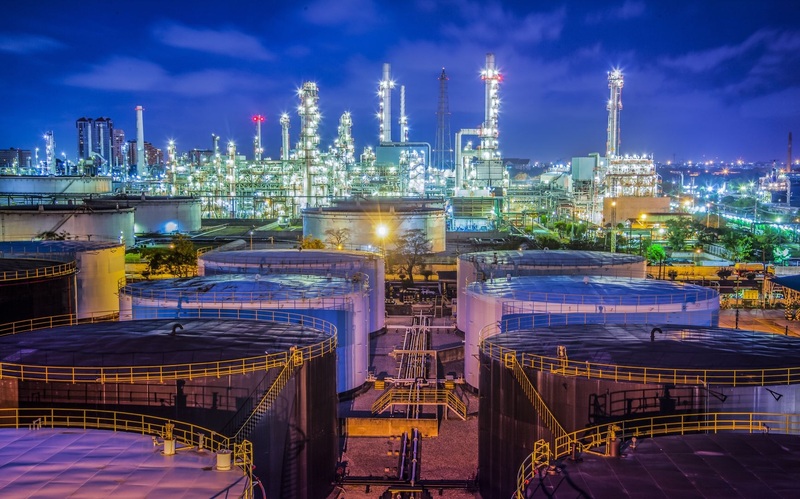 The in-depth classification is widespread but it addresses all aspects of explosion protection and safety measures best practices. 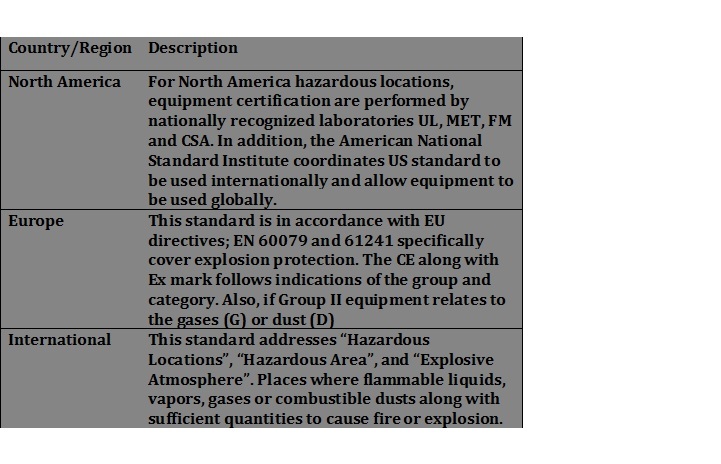 All these classes are categorized as per different explosives or ignitable substances that are found in the Atmosphere. The intent of this paper is to focus primarily on Class I division 2 locations and its further classification. Refer to the brief explanation and description below for the North America Classification system. As discussed above Class/Division system are specifically used in North America for the purpose of regulating and defining hazardous locations for equipment safe handling and installation. However, outside of North America, the zone system is being used as a primary source equipment in manufacturing and installation. Zone system is quite similar to class/division system; it defines and categorizes hazardous area and potential risk sources. Refer figure 2 for a detailed classification. To get a clearer picture, frequency of occurrence of an event determines the hazard level of that location. Hence, the more flammable materials are present in atmosphere the more are chances for an explosion to occur. In addition, it is important to understand how the flammable substances/materials are categorized and how to get a better understanding of each of them. Note: Ignition or explosion can only occur when flammable gas,liquid or solid material have their lower and upper flammability limits. Hence,not necessarily the presence of flammable material will result in a fire hazard. Equipment used in hazardous area are assigned to a temperature class which defines maximum surface temperature the device can go. In particular, this temperature should not exceed the ignition temperature of the atmosphere. With minimum presence of ignition temperature even in normal atmospheric pressure a spark or flame is able to set fire or a combustion or independent heating of the element. The dedicated rating for a temperature class also helps in preventing combustion that is dependent on the combustion point of the material present in that area. 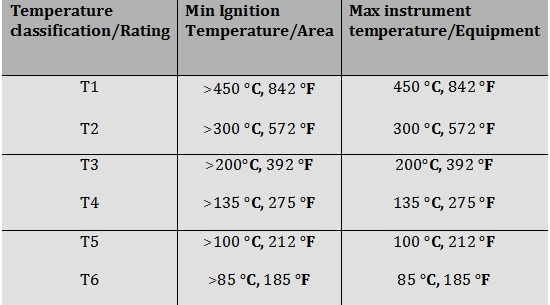 Temperature classification are given to hazardous areas and temperature class ratings are applied to instruments.Values for the temperature classification ranges from T1 to T6,where T1 implies a minimum ignition temperature (>450° C [842° F) and T6 has a minimum ignition temperature >85° C [185° F]. Temperature class rating, this relates to the maximum temperature instrument is supposed to produce typically at a 40°C environmental temperature. However, this might vary in reference to other ratings.T1 thru T6 are used in temperature class ratings, where T1 is maximum temperature generated by instrument at 40° C is 450° C and T6 is the maximum generated by the instrument is 85° C.
It is also important to know what sources can initiate a hazard,below is the list.Table A provide a general source of ignition while table B shows ignition sources from industrial electrical equipment. The mission of every manufacturer,industry owner, and installer is to adhere to the regulations and standards for maximum security in their facility. Specifically for hazardous locations following safety guidlines is a must, it helps in avoiding any kind of danger and potential hazard instances. Hazardous area can be defined as any industrial space with presence of three fundamental components: flammable substance, oxidizer and source of flame/ignition. Hence such areas require specialized equipment to prevent and avoid explosion. This might sound as a straightforward process but it isn’t, these are guided by regulations, guidelines and laws which are already discussed above in this paper. The National Electrical Code (NEC), National Fire Protection Association, OSHA has set up benchmarks for hazardous area explosion protection. North America region Factory Manual (FM) and Underwriters Laboratories (UL); and Canadian Standard Association (CSA) for Canada are the certifying agencies, recently the two of them are working together on implementing programs to be made valid in both countries. Electrical equipment to be used in hazardous area should be installed with one or more protection techniques for proper and secure operations. As mentioned earlier, there are several methods by which equipment can be made flame and explosion proof, limiting energy and other sources to be used in hazardous locations class 2 division 2. Refer to the figure below for a detailed explanation. Arista offers a wide range of panel mount and fully sealed TPC, ARP-2200AP-G00 and ARP-5500AX-G00 Series, designed for use in environments where the existence of flammable gases or vapors and/or combustible dust may be presence in the air during an abnormal occurrence such as a spill or a leak and to prevent ignition of flammable substances like gases, vapors and liquids that are present within Class 1 Division 2 hazardous zone applications. ARP-2200AP-G00 Series is Panel Mount TPC products family, ARP-5500AX-G00 is stainless steel fully sealed, fully enclosed TPC which has no external vents protecting components from gases, dust, dirt, moisture, chemicals, oil, and other external contaminants in an explosive environment. Both series are powered by Intel i7 CPU and integrated LCD display size ranging from 15″, 17″, 19″ to 21.5″. Powered by Intel i7 CPU and can be extended up to 16GB system memory. Unit is capable to run Windows 64-bit operating system to meet most of SCADA/HMI applications. 21.5″ Wide Screen, 16:9 aspect ratio, full HD 1920 x 1080 resolution keeps Arista’s Class 1 Division 2 hazardous zone TPC ahead of market trend. Both ARP-2200AP and ARP-5500AX Series have ACP Enabled Thin Client version as well. ARP-2200AP and ARP-5500AX Series ACP Enabled Thin Client version offers centralized management solutions for factory floor, plant operational and hazardous area locations. UL/CSA Listed safety standards, non incentive industrial panel PC for use in Class 1 Division 2 Groups A, B, C, D Hazardous classified locations. 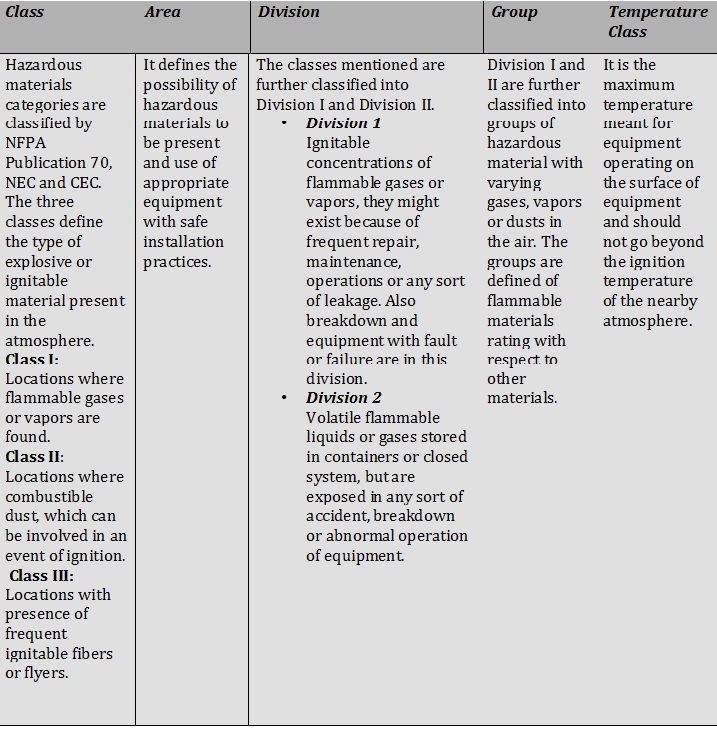 The HMI application meets Class I Division 2 hazardous locations (North America Classification). Arista is a pioneer in the industry of product development, engineering, manufacturing and customer support. Originally formed in 1994, Arista has offices in China, India and Taiwan. With years of experience and expertise in Industrial Panel PCs, Industrial Monitors, Box PCs and Fanless Embedded computers, Rack Mount Computers, ACP ThinManager Ready Thin Clients, embedded CPU Boards and video Extender/Switches. Arista has served customers with reliability, Integrity and Trust. Find out more here. 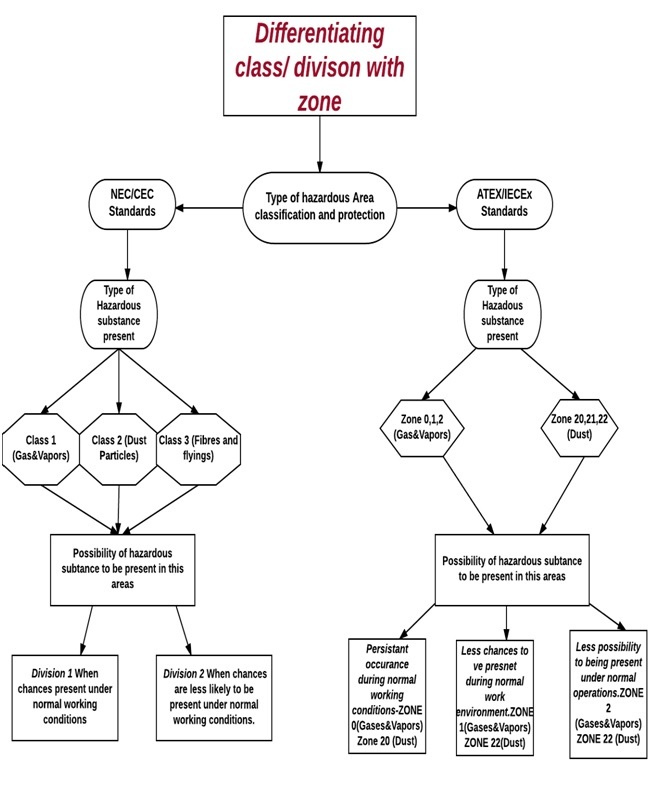 This paper provides only an overview of hazardous locations,class 1 division 2 and zone classification for equipment safety. It should not be considered as a substitute for safety guidelines and regulations. It is also recommended to consult an official legal advisory or other concerned authority in your organization for latest and updated safety regulations. I am interesting in using you Class I Div 2 Computers. I am a system integrator. I also have an active project for Class I Div 2 WIFI Hotspots. Our team will get in touch with you shortly,thank you posting your query!